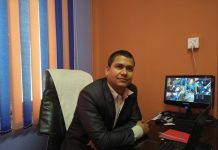 Information Security Response Team Nepal Partnership with One Cover Pvt. Ltd, ICT FRAME Magazine, Centre For Cyber Security Research and Innovation has hosted the first ever Cyber Security Meetup in Kathmandu, Nepal on April 4, 2019 (Chaitra 21, 2075) at Nepal Telecom’s Building, Babarmahal, Kathmandu, Nepal. The event is Supported By Laba Pvt Ltd, Broadway Infosys Nepal, and Nepal Telecom Training Center Babarmahal, Kathmandu.